Are you guys checking in with all the amazing links in the Hunger Games link party? Well I have been like every couple of hours it is so fun to see all of your creations. Also have you had a chance to enter the awesome paper doll giveaway, they are so cute that I plan on framing mine! In preparation for all the wonderful book suggestions we’ll be getting from the amazing book bloggers that are joining us for this blog party I wanted to share a tutorial for making a fun bag possibly to hold all the titles you’ll be itching to pick up. A few weeks ago my friends got together and made these adorable bags, they each made slightly different ones and I love them all. You can use store bought bags in fun colors like Linda‘s blue and white one, or mix color and glitter ones like Tanya and Alexis’ gold and black ones, or make your own bags from old T shirts and use bleach like Heidi did. This will show you how to make the black and gold basic one like my sister made but you should easily be able to tweak it to fit your own taste. Make yourself a stencil design and cut it out of freezer paper. You can do this with a cutting machine like a cricut or with a steady hand and a razor blade. Make sure the shinny side is down. 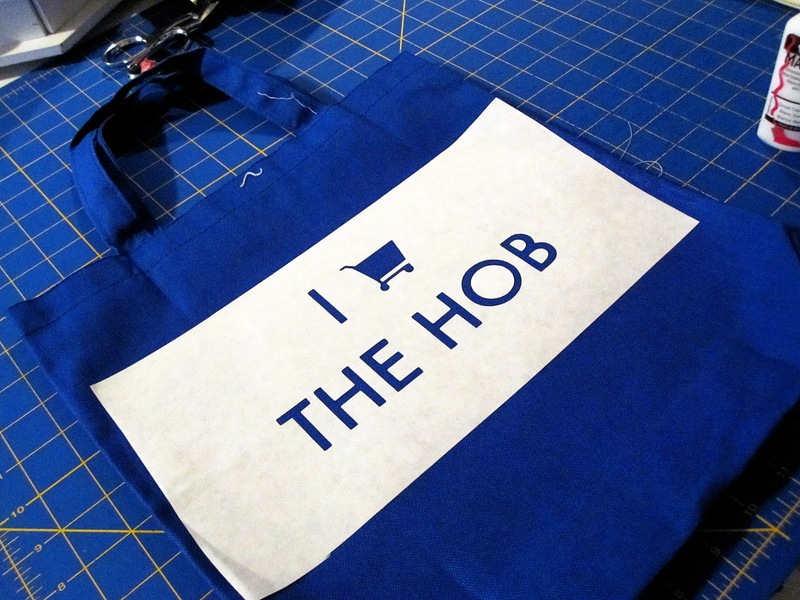 Iron your stencil onto your bag. Insert a piece of freezer paper shinny side up inside your bag to protect the paint from seeping through. Apply your paint and let dry. I find it’s better to blot rather than brush. If you want to add a glitter layer do that and allow to dry. I’ve talked about making iron-ons here and here so I’ll keep to the key points today but if you’re feeling a little lost you might want to review those post. First make your mockingjay template you can get the image I used here. I use my cricut and a program called sure cuts a lot but you can also just traced the design onto your Ultra bond. You need to decide how big your image is going to be. 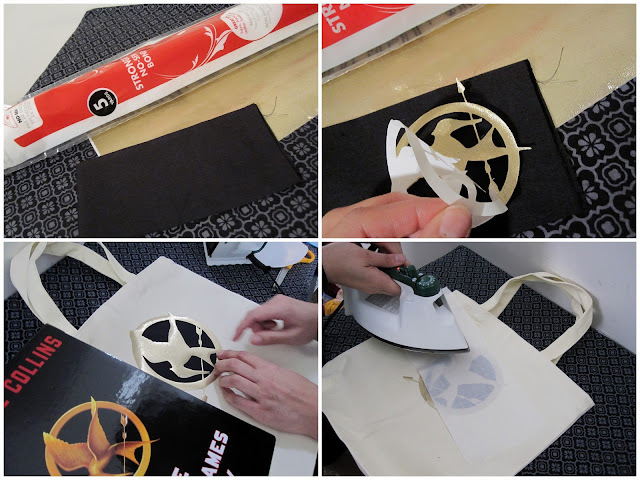 Cut your mockingjay (either by tracing and using scissors or a razor blade) or using a cutting machine. 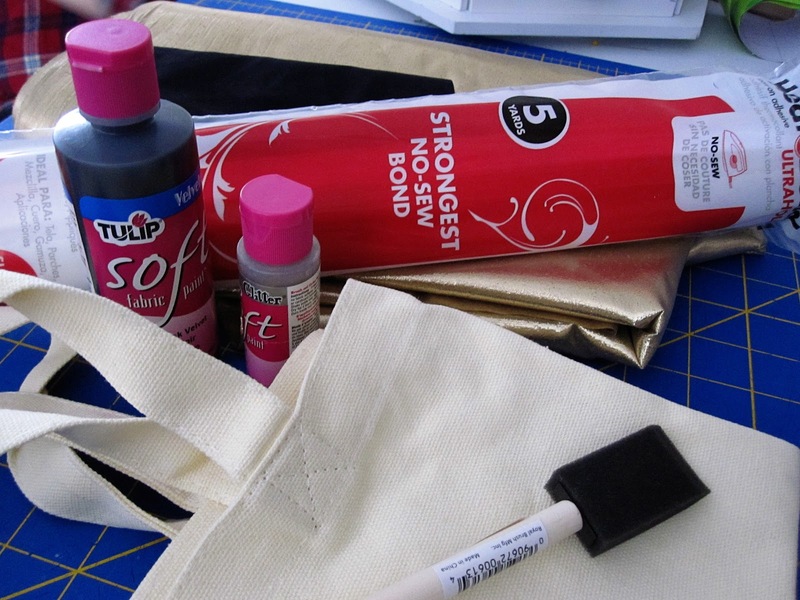 Next make your black iron on fabric the same way you did the gold. Then using your gold mockingjay as a stencil trace the inner circle onto the black fabric (or the paper side of the black (now iron-on) fabric) and cut a little larger than your circle. Peel the paper off of your iron-ons and arrange on your bag. 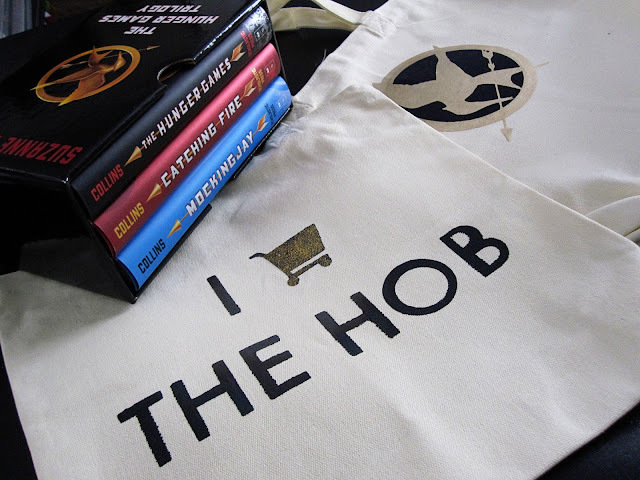 Fill your bag with books, groosling or dead rabbits, okay maybe just books or groceries. And maybe while I was helping them put together these bags I had to make my own sassy ode to Katniss shirt using the same freezer paper technique after receiving this mind numbing meme in my email inbox. I’m so loving this Hunger Games blog party all the projects, guest and giveaways, so much fun. If you’re just finding this post be sure to check out all the others fun posts in my “book geekery” category. UPDATE: I am now selling I Shop the Hob Bags in my Etsy shop for those of who aren’t craft or don’t have the time to make your own! I have a page for Blog Buttons in the top tabs. Leave a button if you like so others can find you. If you have a place for mine, I’d appreciate that too. The shirt came out so great! I may need to make one next craft day because I love it so much. Can I copy you, please? :) So creative!!! Really how do you think of these things?! That shirt rocks by the way!!! Genius. I want them both. Great ideas!I’m featuring u on facebook today 2! Love the shirt! Can’t wait to see the movie! That is one awesome t-shirt! I cannot wait to see the movie! Great job on the tut. Is this book series as amazing as everyone says? I triple puffy heart LOVE this!!! Love the shirt. 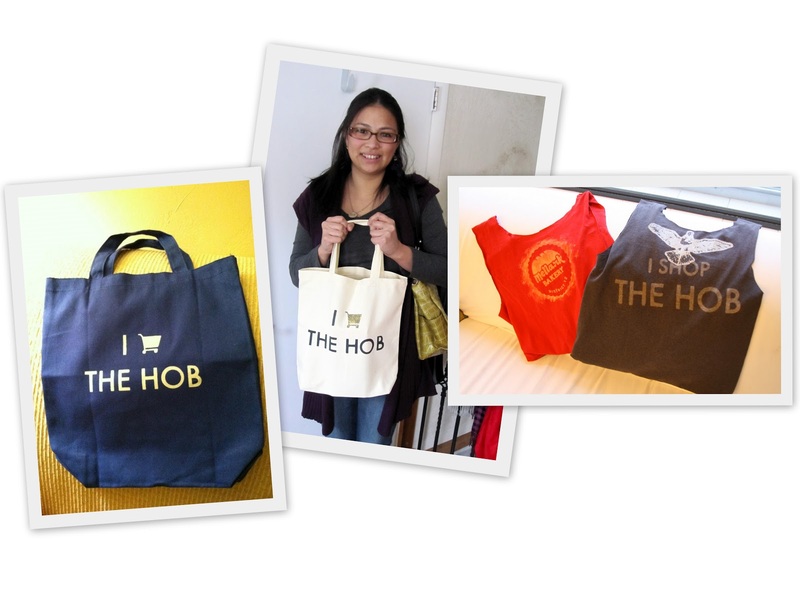 Love the bags. Love the books. So cute and creative!! Thanks for sharing this. I really need read this book! I’m going to start it next week. Love this bag!!! Sharing on my facebook page! 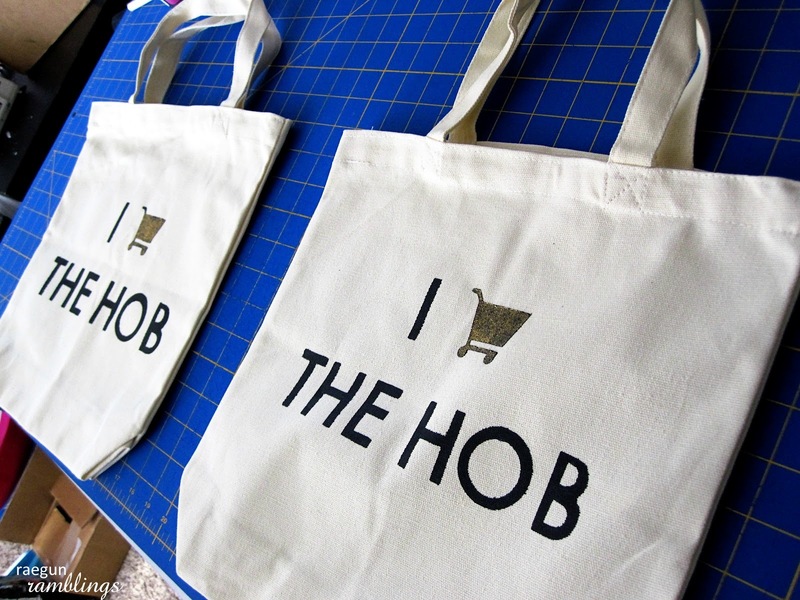 I love your idea with the bag stencil. Looks like an idea people can adapt to any design they would like. I’ve never seen the gold you used on the decal. I’ll have to keep an eye out on that. Thanks for linking to the Your Cozy Home Party Marissa! Great idea!!! BTW – love the Tshirt you were wearing in pic – LOL. Thank you so much for sharing! My girls and are really excited about the movie and they were planning on making their own shirts. This will help. Thanks! I just started reading The Hunger Games, so yeah I’m a bit behind the times, but now that I am into the first book, I’m obsessed…your shirt made me laugh! I love it!! Super cute! i am obsessed with the hunger games. i love this! So awesome!!! I can’t wait for next week, and this would be great to take. Thanks for linking it up at Pomp Party this week. I love all the awesome stuff you made! I just read the series this past week and I am totally obsessed! I wish there were more books!!! Love your Hunger Games stuff and your tutorial is really easy to follow. Thanks for sharing at our party this week. LOVE LOVE LOVE this tutorial and all your stuff! we are featuring this today and welcome back to the party, Marisa! Thank you so much for linking up all your projects about The Hunger Games. I just started reading the book so not sure what all the terminology means but looking forward to finding out what this is all about..I hope you’ll stop over again this weekend and link up mor fun projects. Wishing you a wonderful Sunday! I am so sad there won’t be any more Hunger Games posts for a while! Check it out and THANK YOU for your inspiration! I’m so glad you guys like my geeky escapades! Interesting post. Now you can use this service providers directory to promote shopping bags import & export business.